August 22 - Queenship of Blessed Virgin Mary - Memorial - My Catholic Life! Mary is that heavenly queen in the mysterious vision of the Book of Revelation in which appears “a woman clothed with the sun, with the moon under her feet and a crown of twelve stars on her head” (Rev: 12:1-3). The complex symbolism of this crowned empress encompasses Mary, Israel, and the Church Herself. Mary’s coronation, the Fifth Glorious Mystery of the rosary, has not been defined dogmatically, but has been celebrated liturgically, and depicted in art, since early medieval times. The most ancient depiction of Mary as queen is a mosaic from the 500s in a small church in the historic center of Rome! But the feast day of her Queenship was only placed in the Church’s calendar in 1954. 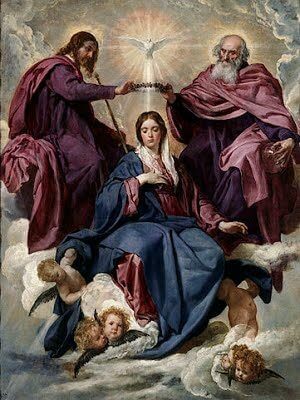 Vatican II stated unequivocally that ”Mary was taken up body and soul into heavenly glory, and exalted by the Lord as Queen of the universe…“ (Lumen Gentium, 59). After the liturgical reforms of Vatican II, the octave of Mary’s Assumption was abrogated, but is still recalled in her Queenship being commemorated eight days after August 15th, showing the connection between the two celebrations. Earthly kings, queens, and kingdoms, so visible, so present, and so impactful throughout the lived history of mankind, are, at a more cosmic level, images or signs of the structure of authority that lies behind all creation. Mankind naturally organizes its public life to ensure peaceful co-existence with others, to promote order and tranquility, and to foster the common good in a thousand ways. This secular response of establishing a structure to manage together what cannot be managed alone is universal and always includes certain leaders to represent the organized community. All of this has a religious equivalent. A sacred canopy hangs over the world. A timeless, divine mega-structure encompasses under itself all of the smaller, temporary civic structures. The man anointed as king, the woman crowned as queen, the order they impose through a just rule in a secular polity, point to something else—an underlying, and overarching, sacred polity in which God rules His creation like a fatherly king. In this timeless theological union the feminine presence is felt. The queen mother is there, interceding with her king-son on behalf of His subjects. She worships with them but also receives their honor. The accolades directed at her are deflected, mirror like, to the greater One to whom she is holy daughter, holy mother, holy spouse and holy queen, our life, our sweetness, and our hope. Mary, Queen of the Universe, in your Son’s kingdom the faithful struggle to be faithful and to be fruitful. We are under your regal, yet maternal, care. May we please both our King and Father, and you, our Queen and Mother, since all parents are deserving of their children’s honor.